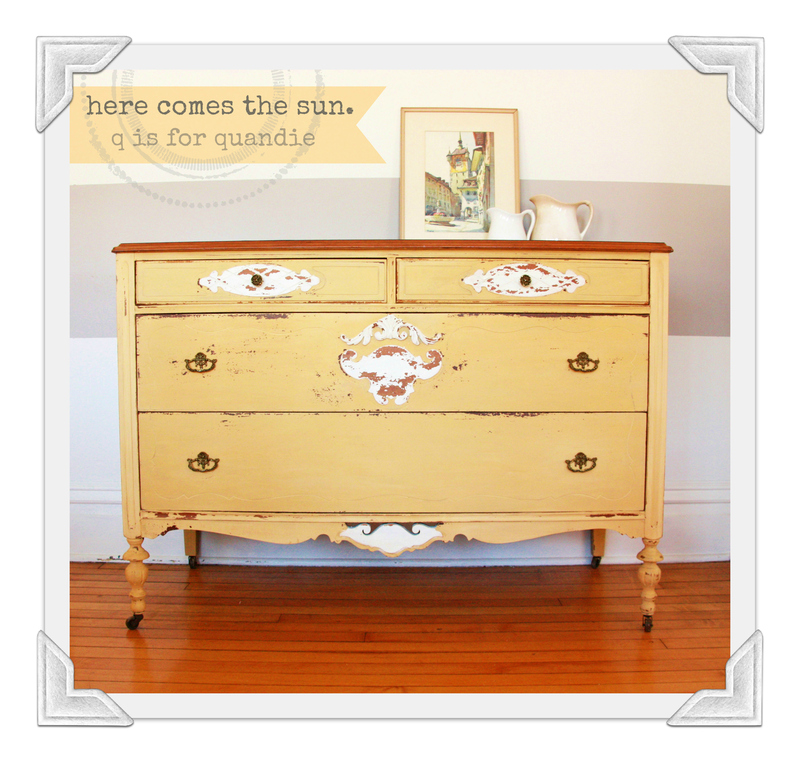 In honor of spring, I decided to paint this dresser in a bright and sunny yellow last weekend. I’ve actually had this paint since last fall just waiting for the perfect piece. As soon as I saw this one on craigslist, I knew it would be lovely in yellow. Feel free to skip this next bit if you are only here to see the pictures! 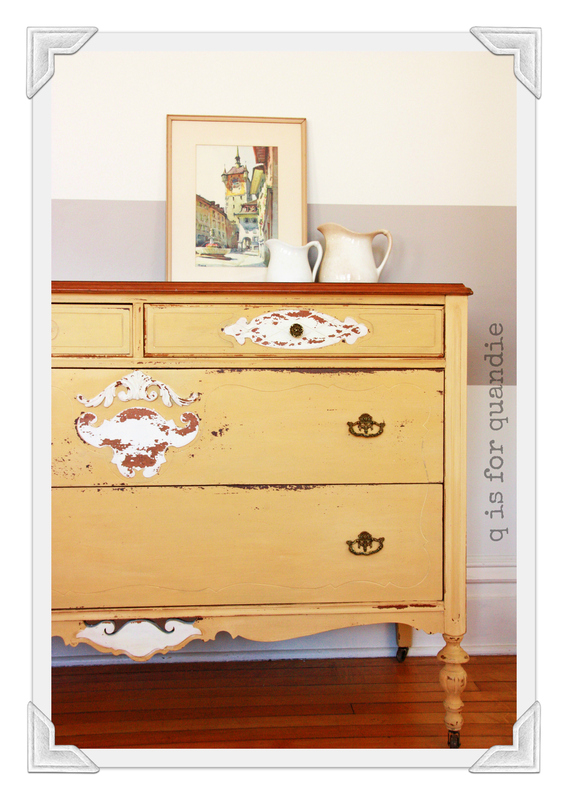 Painting details: painted in MMS Mustard Seed Yellow milk paint, details painted in Linen, finished with MMS clear wax. New to me, I left the top alone. It seems to be more and more popular to leave the tops of pieces stained, so I thought I would give that a try. I cheated though … the top of this one was in good enough shape as is, I just spruced it up with a little MMS hemp oil. I’m still not brave enough to strip and stain. Maybe I will tackle that skill this summer. 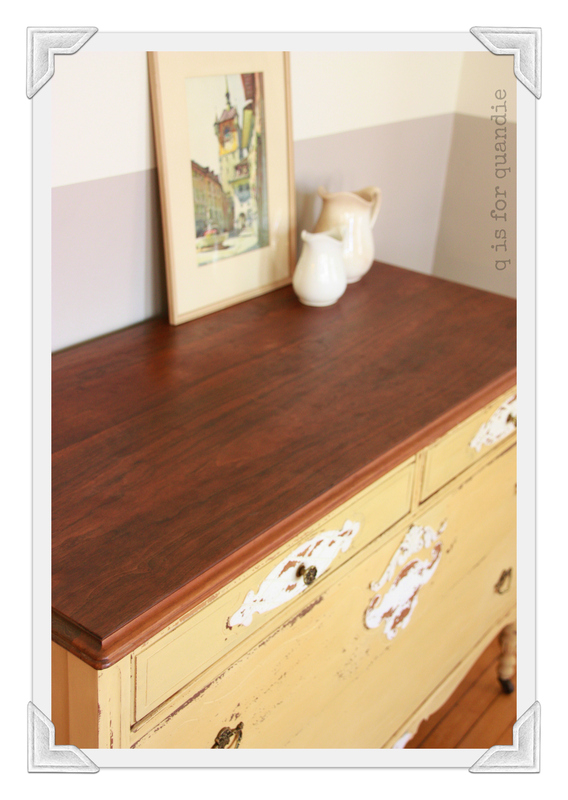 The hardware on this dresser was quite lovely, and I had all of it, so it stayed. As you can see, I got a lot of chippy-ness … especially on the Linen details. It’s a perfectly lovely little breath of sunshine to welcome spring. Wish I had a fresh bunch of daffodils to stage my photo, but we are still a bit away from daffodils here in Minnesota. Just imagine them there in that ironstone pitcher. Great song one of my favs and the perfect intro. Once again Quandie, she charming. So just how many pieces will you be painting this weekend? Thanks Victoria! Seeing as we just got around 6″ of fresh snow, I’m thinking this will indeed be another good weekend for staying inside and painting some stuff! Beautiful piece. Love the yellow, white, wood combination. Absolutely Fantastic! I love the yellow and the chippiness! Absolutely gorgeous – you can almost smell spring in the air! 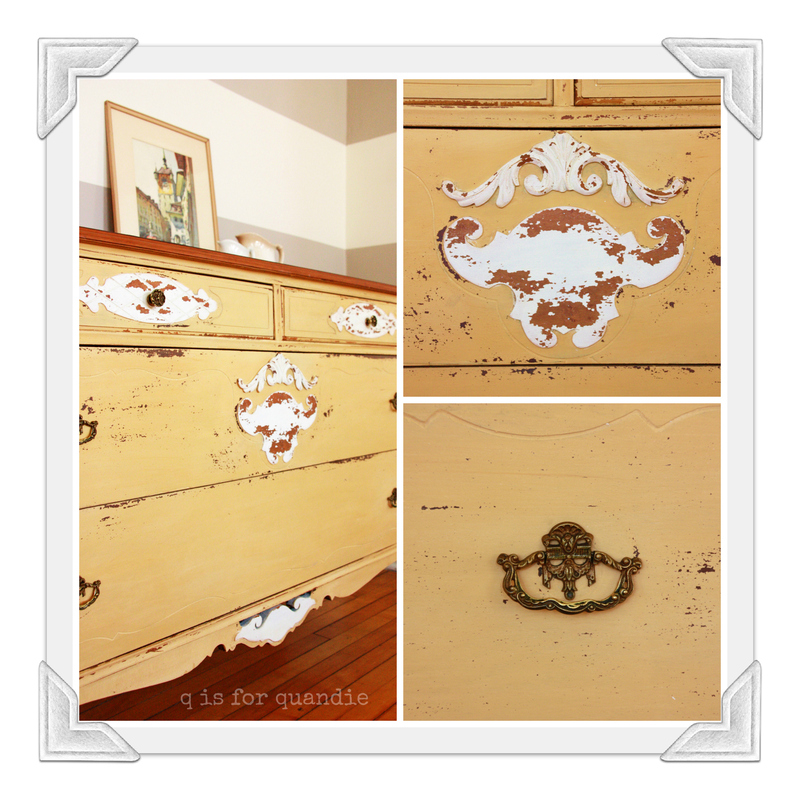 Love the yellow….love this piece! A real work of he-ART! There are daffodils for $1.99 a bunch at Trader Joe’s and yes, they would look perfect on this sunny beauty. They have a really yummy salad at Trader Joe’s that I love too … I should swing in there on my next lunch break! I have been seeing a lot of yellow dressers and chests lately, and I love it! Such a happy color, and this shade of yellow is gorgeous! It is sunny and cheerful. And it was the first of my pieces that sold at Junk Bonanza! It’s no wonder, it is a beautiful piece! Where is the Junk Bonanza located?